Today, when digging up my old articles from the early days of Magpies Zone on my computer, I found this interesting article about letters from someone in the past which I don't know if he still alive now, or remember that he ever contacted me about our legendary player George Robledo. My reaction for his first letter is very interested, as you know I'm collecting all the rare information about anything related to Newcastle United and the players. So I have quick reply him that day and get as quick second email respond from David. But unfortunately there're only twice encounters between us, since then I have lost all my emails on my old email provider. If you ever read this again David, his son, or someone else who is having relationship with Mr. David Kemp, please give him my warm greeting as an old friend. I'd love to hear from him again and still waiting for the photographs. Thanks! I have sent this info to the club and the match day prog but nobody seems interested and I just want the Toon Army to know about it. My son recently went on holiday to Chile with his girlfriend who is half Chilean. I asked him to see if he could find George Robledo's grave as I thought I could remember that he died out there. As lads in the early fifties he and his brother seemed amazingly exotic to us and he has always been one of my all time heroes. To cut a long story short they did eventually find the grave in a mausoleum for former football stars in the main cemetery in Santiago. They left flowers and a message in Spanish saying that he would always be remembered in the Toon. They also took photographs of the grave. Is anybody interested? I cannot believe that I am the only Mag who remembers one of our greatest ever players. I have been in touch with my son, who works in London to see about getting you the photographs and will let you have them as soon as possible. Robledo was one of two brothers who played for us from 1949 to 1953. Ted was a right half and an average player. In to-day's terms he was a squad player rather than a regular, but George was the real star. 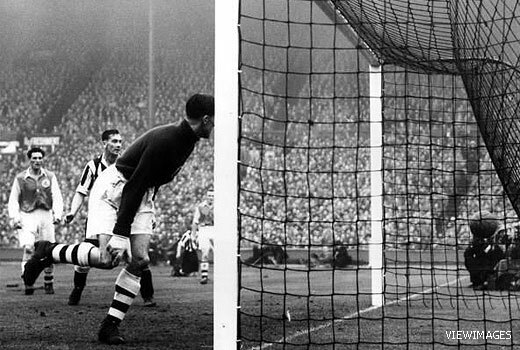 He scored 39 goals in one season, including the only goal when we beat Arsenal in the Cup Final in 1952. He and Milburn were a great combination. He was strong, quick, quite small, but thick set and very difficult to knock off the ball. 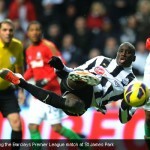 He had a wonderful eye for the goal and never knew when he was beaten. In a team of stars, he shone brighter than most and as a South American he stood out. Virtually every player in England was British at that time, so he had an air of glamour and the exotic about him. Black hair, olive skin, different features, foreign name, he seemed like someone from another world to us. I think we signed the two brothers from Barnsley, and I believe that his father was Chilean and his mother from Yorkshire, but I am not so sure about that. Certainly his second name was Oliver, which may have been his mother's maiden name. I have never forgotten him and when I knew my son James was going to Chile with his girlfriend on holiday, I thought it was too good an opportunity to miss. I asked them to see if they could try to find his grave as I was pretty certain he had returned to Chile and I thought I had read of his death in The Journal. I contacted the Chilean football websites and was advised to try searching the main cemetery in Santiago. I also discovered that Robledo was a great hero in Chile, one of their all -time top 20 players. Desde Chile escribo, necesito contactar personas que me puedan aportar con Videos, fotografias y datos de “George Robledo” jugador del Newcastle. I was 14 and a Colo Colo die-hard fan when George and Ted Robledo came from England to join the club. I’ll never forget Jorge’s debut match against Universidad Catolica. Clearly another series player. An incredible technique with the ball and a superb passing ability. He’d be brutally fouled by defenses trying to stop him at all cost, yet Jorge would never complain to the ref, let alone retaliate. Truly a gentleman of the sport. And not a player that would be felled easily either as he was very sturdy. I’m surprised his height being stated at 5-9 on Internet. I’d say he was at least 6 feet tall. I recall standing very close to him a couple of times. I was sad when I heard about his death and Ted’s. I did not know the details about Ted until I read it on Internet recently. And not too many football fans to reminisce with about the “era de los Robledo”, at least here – I moved to the US in 1963. But when my wife and I went to London on honeymoon in 1972, quite a lot of football fans there still remembered the Robledo brothers. Como el Colo Colo no-hay’ – All Right!!! as we chanted so loudly in the Nacional. May be that was meant especially for George, in his language too. Jorge Robledo was born in Iquique, Chile. I’m very proud of him because he contributed to fame of my city “Iquique, land of champions” I would like you help me to know more about Jorge and Ted Robledo’s life in England. I went regularly to every home game in the early fifties – I was about 14 – not many girls went. 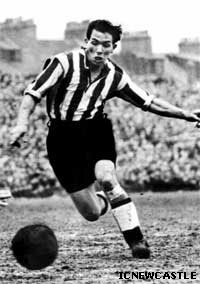 George Robledo was a real star and he and Jackie Milburn had a real understanding of each other’s play – a great team! Writing this having just heard about Charlie Crowe’s death – a really steadfast reliable halfback. A privilege to have watched them all. I have heard so much about these toon legends, I have heard that there was a novel written about one of the brothers, Is it true? From Chile I write, I need to contact people who can contribute to me with Videos, photographs and data of “George and Ted Robledo” players of the Newcastle. I work in the school he went to in Brampton if that’s any help. I found out about him when reading some old school logs books written by the headteacher. Im an Arsenal fan but my uncle is engaged to the Robledo brothers niece Amanda, his other brother Walter is still alive and i am sure he has a wealth of information that you guys will find useful. When i learned of his existance and career i was surprised that i had no knowledge of the brothers considering the effect they clearly had on some people! George Robledo, for anybody, kid or adult (kid as far as my experience was at that time)-who took football seriously in the 1940s/50s will have names like George Robledo etched forever on their subconscious. I saw him play for several seasons when Newcastle FC came down to play Stoke City at the Victoria Ground in the then First Div. A terrific player -My old man (long dead now) rated him very highly. Of course ‘wor’ Jackie was the main man but make no mistake about it -for the impartial fan, George Robledo was also greatly admired in the same bracket. Great that you took the trouble to find his Grave when in Chile and were lucky enough to find it. Well done indeed!